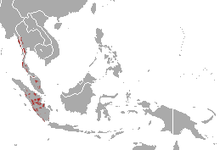 The Malayan tapir (Tapirus indicus), also called the Asian tapir, Oriental tapir, Indian tapir, piebald tapir, giant tapir, skunk tapir and panda tapir, is the largest of the five species of tapir and the only one native to Asia. The scientific name refers to the East Indies, the species' natural habitat. 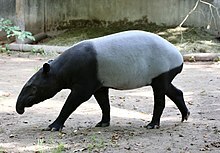 In the Malay language, the tapir is commonly referred to as cipan, tenuk or badak tampung. Malayan tapirs grow to between 1.8 and 2.5 m (5 ft 11 in and 8 ft 2 in) in length, not counting a stubby tail of only 5 to 10 cm (2.0 to 3.9 in) in length, and stand 90 to 110 cm (2 ft 11 in to 3 ft 7 in) tall. They typically weigh between 250 and 320 kg (550 and 710 lb), although some adults can weigh up to 540 kg (1,190 lb). The females are usually larger than the males. Like the other types of tapir, they have small, stubby tails and long, flexible proboscises. They have four toes on each front foot and three toes on each back foot. The Malayan tapir has rather poor eyesight, but excellent hearing and sense of smell. Malayan tapirs have very poor eyesight, making them rely greatly on their excellent sense of smell and hearing to go about in their everyday lives. They have small, beady eyes with brown irises on either side of their faces. Their eyes are often covered in a blue haze, which is corneal cloudiness thought to be caused by repetitive exposure to light. Corneal cloudiness is a condition in which the cornea starts to lose its transparency. The cornea is necessary for the transmitting and focusing of outside light as it enters the eye, and cloudiness can cause vision loss. This causes the Malayan tapir to have very inadequate vision, both on land and in water, where they spend the majority of their time. Also, as these tapirs are most active at night and since they have poor eyesight, it is harder for them to search for food and avoid predators in the dark. A small number of melanistic (all-black) Malayan tapirs have been observed. In 1924, an all-black tapir was sent to Rotterdam Zoo and was classified as a subspecies called Tapirus indicus brevetianus after its discoverer, Captain K. Brevet. In 2000, two melanistic tapirs were observed during a study of tigers in the Jerangau Forest Reserve in Malaysia. The cause of this variation may be a genetic abnormality similar to that of black panthers that appear in populations of spotted leopards or spotted jaguars. However, unless, and until, more T. i. brevetianus individuals can be studied, the precise explanation for the trait will remain unknown. 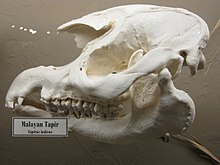 The Malayan tapir was once found throughout the tropical lowland rainforests of Southeast Asia, including Cambodia, Indonesia, Laos, Malaysia, Myanmar (Burma), Thailand, and Vietnam. However, its numbers have decreased in recent years, and today, like all tapirs, it is in danger of extinction. Because of their size, tapirs have few natural predators, and even reports of killings by tigers are scarce. The main threat to the Malayan tapirs is human activity, including deforestation for agricultural purposes, flooding caused by the damming of rivers for hydroelectric projects, and illegal trade. In Thailand, for instance, capture and sale of a young tapir may be worth US$5500.00. In areas such as Sumatra, where the population is predominantly Muslim, tapirs are seldom hunted for food, as their physical similarity to pigs has made tapir meat a taboo, but in some regions they are hunted for sport or shot accidentally when mistaken for other animals. Protected status in Malaysia, Indonesia, and Thailand, which seeks to curb deliberate killing of tapirs but does not address the issue of habitat loss, has had limited effect in reviving or maintaining the population. ^ "Tapir l'inde, Tapirus indicus". Nouveau dictionnaire d'histoire naturelle. Paris: Deterville. 1819. p. 458. ^ Grubb, P. (2005). "Order Perissodactyla". In Wilson, D.E. ; Reeder, D.M (eds.). Mammal Species of the World: A Taxonomic and Geographic Reference (3rd ed.). Johns Hopkins University Press. p. 633. ISBN 978-0-8018-8221-0. OCLC 62265494. ^ "Cambridge Journals Online - Abstract". Journals.cambridge.org. 2001-02-27. Retrieved 2011-01-15. ^ "Tapirus terrestris (lowland tapir)". Digimorph. 2002-02-08. Retrieved 2011-01-15. ^ Fahey, B. 1999. "Tapirus indicus" (On-line), Animal Diversity Web. Retrieved June 16, 2006. ^ Simon, Tamar. "The Tapir: A Big Unknown" article from Discovery Channel Canadian website Archived 2006-06-16 at the Wayback Machine, July 22, 1999. Wikimedia Commons has media related to Tapirus indicus.